Sealaska is the largest landowner in Southeastern Alaska and holding company for a number of subsidiaries in the forest products, plastics, gaming and mineral exploration industries. Sealaska hired professionals of M&A Capital to, among other things, raise long-term capital to pursue specific opportunistic investment opportunities to maximize shareholder value. Professionals of M&A Capital considered all non-dilutive sources of capital to allow Sealaska's management board to select the most flexible, lowest cost option available. In addition, Sealaska valued M&A Capital professional's knowledge of which lenders in the financial community tended to build long-term relationships with its borrower clients. 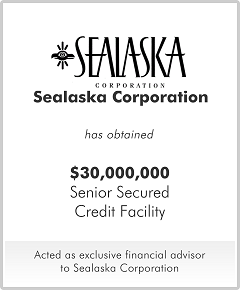 Sealaska selected a senior secured long-term $30 million credit facility that provided it with the financial credibility to pursue its objectives.